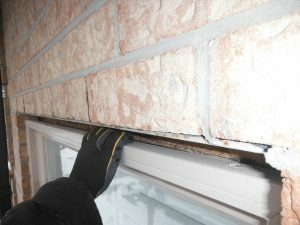 This is the fourth in a series on construction defects found in the Greater Toronto Area, Ontario, Canada. 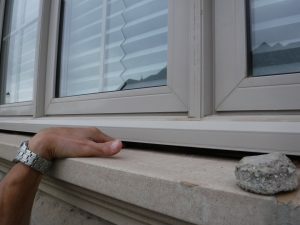 The photo shows a significant gap between the window sill and window frame. The gap is about 25mm. The gap has not been sealed because it is too large for sealant, even with the use of backer rod. All the other windows on the house were sealed. The contractor applying the sealant (“caulking”) would simply have left this gap because it is not his responsibility to compensate for dimensional errors. 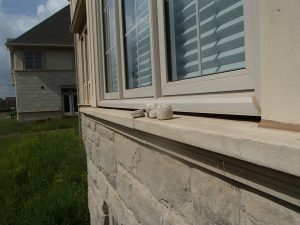 Note that the EIFS has been sealed at the sill. The gap could be filled with additional material such as wood or vinyl or metal. The root problem however, is that the size of the window and the size of the opening do not match. There is a dimensional error. The correct fix is to install a window that matches the size of the opening. The photo at left shows a similar gap, this time above a window. 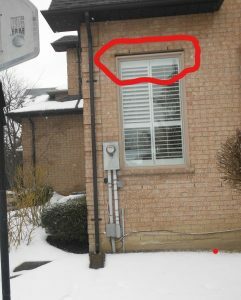 This is from a resale inspection in 2016, on a house that was built 27 years earlier in 1989 in Markham. Because of the layout of the house and slope of the ground, this was not readily visible to the homeowner. I spotted it in the first few minutes of the inspection when viewing the house from a distance. The risk with gaps in the building envelope is that water entry may have occurred. The challenge on this repair is to get the proper fix, which is a properly sized window. There is a risk the builder will use makeshift measures to seal the gap.